This month has been quite a busy social one for me with weddings and birthdays to be celebrated. I am one of those people who can't wear the same dress twice, more so when it is an event to be celebrated with a similar group of friends. Thankfully House of Fraser were on hand to help me out with my little predicament and with these two fabulous dresses from the plus size dresses range. The Dorothy Perkins Leaf Print Sateen Fit And Flare Dress is shown on the left is currently on sale here for just £20 and it is an absolute bargain. When wearing it, there is a zip which runs the length of the back, it has a rounded collar, short sleeves and is Fit and Flare designed meaning that it pulls the waist with a ribbon is and is really flattering. I really love the leaf design which also uses the colours blue and yellow and can, therefore, be accessorised really easily. 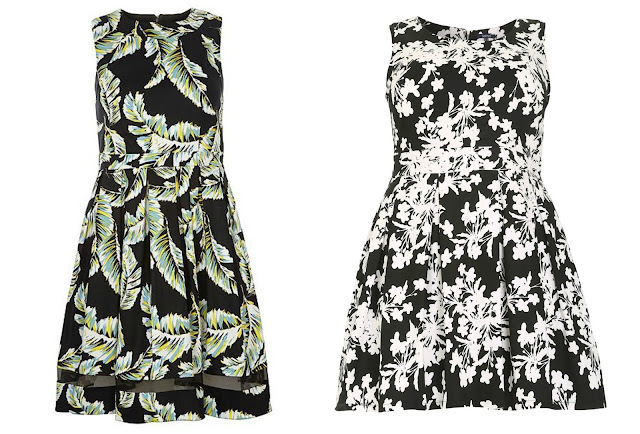 The Black and white floral Samya Pleated Botanical Print Dress is again a dress I absolutely adore. As with the first dress, it is again a fit-and-flare style dress featuring a belted waist and box pleated skirt making it really flattering. It uses a back zip fastener, has a rounded collar and is also sleeveless. As a black and white dress, it can be as dressed up as casually worn as you find comfortable. With both dresses what I found is the sizing was almost spot on. Having the belted waist meant I could pull them in at the sides where they were both slightly too big and it then lifted the dresses so they didn't just hang. When I am buying a dress, for me it is all about fitting around the chest area because if it doesn't fit there, then it can really make an outfit look horrendous. I am not usually a fan of zips on the back of dresses because of the coldness against the skin, but with these two, I didn't notice them throughout either day of wearing them, nor did I feel overly hot and bothered. My favourite of the two dresses is the first one. It fits much more snugly, it is fairly bright and cheerful and I loved the detail on the hem, which I feel complimented the dress. Have you seen any dresses you have really liked of late? Oh wow, that first dress is absolutely gorgeous! You look lovely in both of these outfits, hope you had a nice time celebrating all your occasions! They're both so pretty and look so lovely on you! Have fun with all the things to come! love the black and white dress, i think monochrome always looks classy and perfect for day or night. I love the pattern on the first one especially! You are quite right, fit and flare is so flattering. These lovely examples almost make me want to wear a dress! Both dresses are beautiful. I like the design of the fit and flare. It reminds me of the old A dresses I used to wear when I was younger! Love them! I only wear dresses for special occasions. Looks like there are some good sale bargains around at the moment. I particularly like the leaf one and both dresses look really smart. Easy to dress up and down as you say. They're both lovely dresses but I love the pattern and style of the first one slightly more than the second. I do love a good bargain and these are lovely. The first one is my fave!! Oooh I love the second one, I'm all about the monochrome at the moment! Gorgeous dresses, I love the black and white one. They both look great! Lovely dresses, we are off to a wedding next month so best start having a look around. Fabulous dresses! I do like the second one the most though! I love the black and white dress. I love the design and I think it would go with lots of my own wardrobe. Great post. I love dresses - have several in my wardrobe, but no where to go >_< If you only wear a dress once, what do you do with them afterwards? !